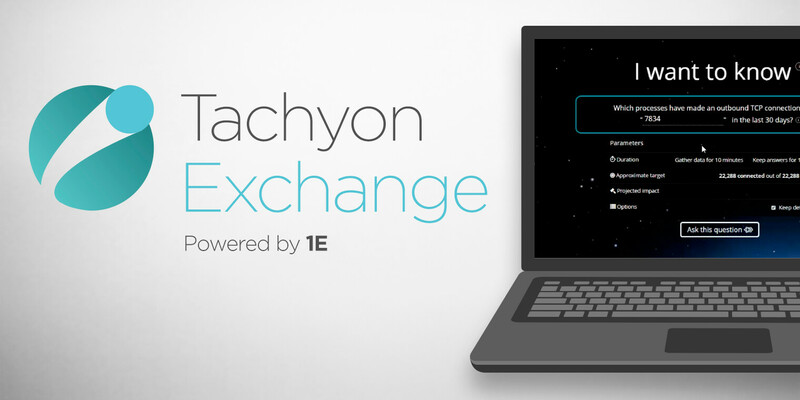 We’ve recently launched the exciting new Tachyon Exchange, a repository for Tachyon Product Packs (PPs) which contain questions and actions that you can use in your organization’s Tachyon environment. Customers can use this portal to submit requests for PPs, which are passed directly to the Tachyon development team for review. However, customer-written PPs can also be submitted for sharing with the rest of the community. The growing library of community created PPs are free to download, modify, and use to suit the purpose of the individual user. A voting system ensures that the most popular community contributions are vetted and highlighted. Question: Tell us about the Tachyon Exchange. Jason: It’s a focus point for community interaction relating to the creation and sharing of instructions for Tachyon which enable new functions in the tool. Ron: Tachyon Exchange is an online community meant to extend the power of Tachyon. It’s a place where the community can find Tachyon Product Packs and share their own Tachyon Instructions with other 1E community members. James: It’s like an “AppStore” for Tachyon Product Packs and information. You can find what you need and implement it right away. Question: What’s one thing you’re most proud of within the Tachyon Exchange? Jason: The diversity of use cases, from Security related to IT Operations and Software Asset Management – there’s a lot of coverage there. Ron: I am most proud of the “Product Pack Request” section, where users can request Product Packs that benefit their company and also have the ability to vote on Product Packs submitted by other users. So, we can ensure we are continually developing Product Packs that customers want and need. Question: What separates the Tachyon Exchange from other types of similar offerings by other vendors? Jason: There are plenty of people in 1E who are passionate about Tachyon – and they will respond to requests for new “Product Pack” functionality. Professionals, free of charge, and because of the love of the product, will pick up your requests and work on your use cases… that’s pretty special. Ron: Tachyon can be extended with “Instructions” which are then bundled into “Product Packs” for easier sharing and distribution. Instructions are written in SCALE (Simple Cross-platform Agent Language for Extensibility). This community site allows you to view and download Product Packs. 1E customers and partners can access the SCALE SDK by logging into the 1E support site. James: The bit that stands out for me is definitely the Tachyon SDK. If a customer is unsure how to modify or submit anything, the Tachyon SDK is available. The SDK describes the language used to build Tachyon instructions and the rich set of things that are available to craft them. This feature is available to customers and partners only. Question: Why will customers and partners be excited to use the Tachyon Exchange? Jason: One of the most powerful things about Tachyon is its extensibility. The Exchange gives people a place to see how others have used the tool, and to benefit from pre-existing instructions which can be downloaded, tweaked if needed and put to use in their own environment with their own “spin” on the functionality. It’s a really powerful and valuable resource. Ron: Like any other online community, it is a place to get new Instruction Sets or Product Packs from not only 1E but also partner and other community members. It also works great for obtaining different ideas on how to expand the functionality of Tachyon. Visit the Tachyon Exchange here. To learn more about Tachyon, visit our website.